The Extension Board is perfectly designed for continuous and heavy usage. Connect more than 3 devices at a time. Made of top grade material to last long. If you use lots of electric devices then one wall socket is not enough for you, you need an extension board. If your charger wire is not long enough and you want to use the device at some place far then you can purchase an extension board. 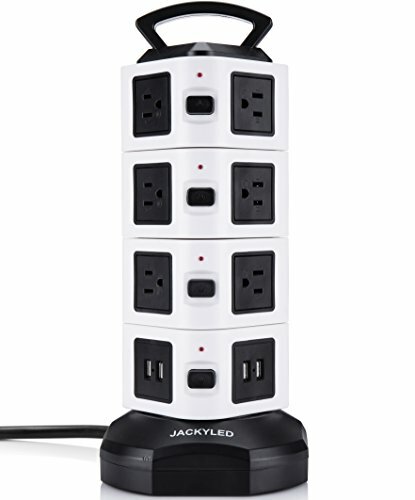 ☑ 14 Outlets and 4 USB ports, a perfect power strip charging for most electrical device at the same time, there’s no need for 2 or more power socket to charge for your device that saves space in your place. After used for some time, it will get a little loose for your plugs. It is a normal phenomenon. So please rest assured on our product.RELIABLE & MAX WATTAGE: RoHS, CE & FCC Certificates. Due to different voltages in different areas, this product is designed to support 110V-250V. If it is used under 125V, the max power will be 125V x 13A = 1625W; if under 250V, the max power can reach 3000W. This power strip is made of fireproof ABS plastic material and PVC, copper cable that is guaranteed to be of high security on charging devices with an overload protection smart control and LED indicator design.